I attribute the original idea for this lesson to Deep Space Sparkle. Like most of us, I just can't resist doing an Eric Carle inspired lesson every now and then, and this is a good one. 1. For seahorses use whatever paint texturing technique you like. We tied it into analogous colors, and I let the students choose two colors that are neighbors on the color wheel. 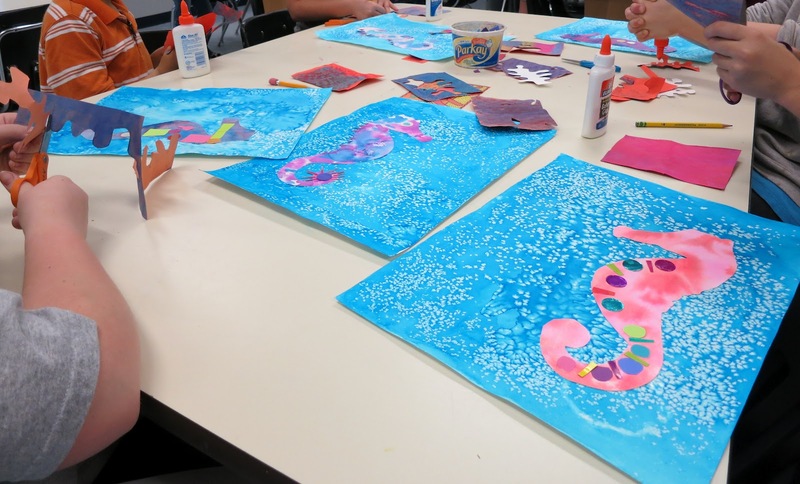 Students' natural inclination is to choose as many colors as possible,but with watercolors, this can be too hard to control. Anyway,we used wet into wet and simply applied the two colors onto a 9X12 paper. 2. Apply a glaze or varnish to the dry watercolor paper. 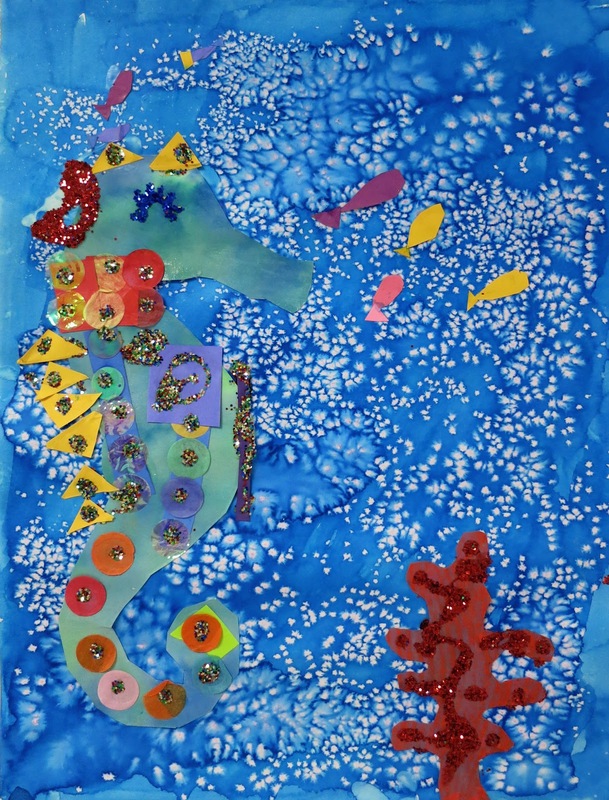 I made a seahorse template for the kids to use. 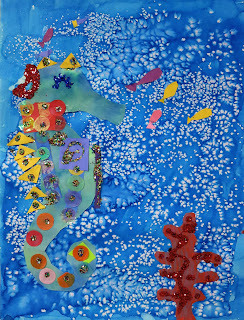 I know, I know... but if you have ever tried to draw a seahorse, it is hard! The template also allows them to make it the right size. and, they do tend to turn out differently because of the way they cut it out. They trace and cut it out of the watercolored paper. 3. 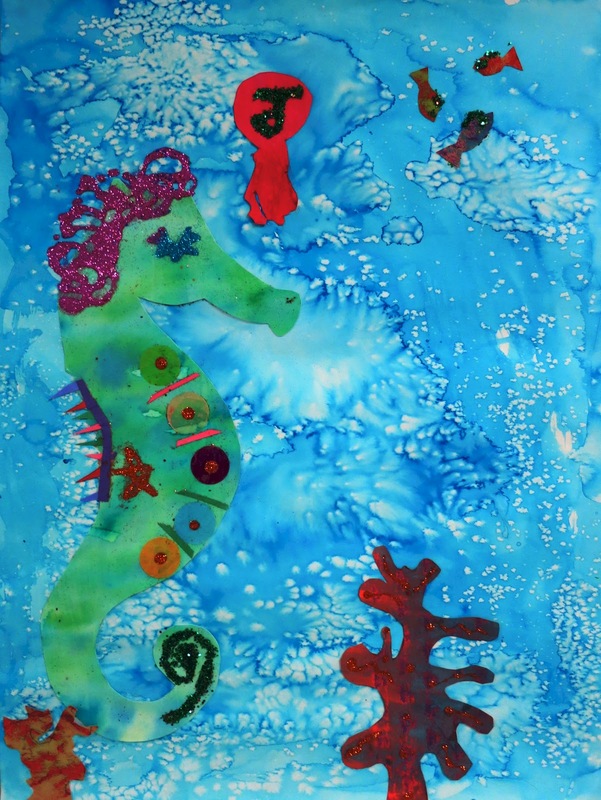 Make a bubbly water background by using liquid watercolor, wet into wet, and sprinkle salt on the top. 5. 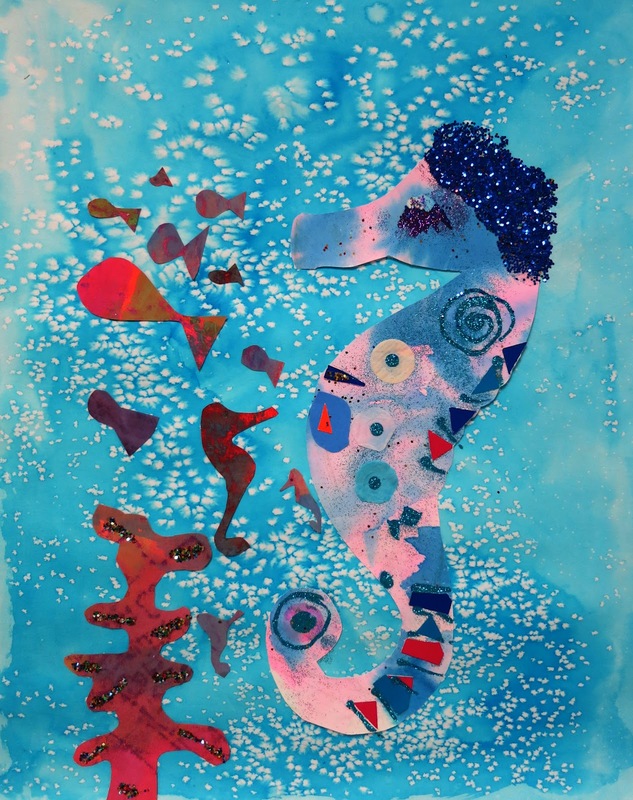 Students can make embelllishments for the seahorse using bits of colored construction paper. They can cut out coral, plants and other little fish for the background. 6. Glitter can be problematic, but I couldn't resist on this project. Have students choose 2 or 3 small areas to put glue on and glitter. Seahorse "hair" can be added or not. Eyes can be open or closed.